We are a group of people which have formed a network in order to focus our individual strength into one single package. We have Design, Print, Server Solutions, Content-Management-Systems and Webprogramming to offer. Each of us can be addressed individually or be combined in any way as a project requires. We figure if people in or outside of germany visit this site in search of qualified staff, they might find what they need here. No brand without planning. We think before we draw. We develop and design all visual elements like logos, color guides, picture styles, and make sure that their interaction works as a whole. In corporate. We build all of our websites. We take great care constructing easy-to-use interfaces, layered on top of exciting graphical designs. This and impeccable craftmanship in programming lead to a high and lasting customer experience and satisfaction. We use the Typo3 Content Management System for our websites. We provide Offset and Digital Printing Services. For corporate sites. For smaller sites. Or the "I need just one little email-address" type of guy. As a Creative & Art Director, Frederic K. Herring designs printed and web based media. His resumee includes work for Novartis, Roche, Stiftung Warentest, Epson and Bilstein. Founded by Martin Taller in 2002, cmxs is a designstudio for graphic- and webdesign located in Karlsruhe. Georg Theiss is a professional Typo3 programmer from Weil am Rhein, Germany. His resumee includes work for Aldiana, Data Lynx, Arcondis AG, Wirtschaftsregion Südwest, City Offenburg. Jan Kienecker, the founder of Sicde, is a webspace provider from Hamburg and provides his services in a very efficient way: You only buy what you really need. This means that you can define every byte of your webspace as you like. We are very efficient and fast. We deliver what you expect and really need. Sometimes even more. How do we know that we are a good match? We do more in a days work than others might do in a week. We work systematically. You don't pay for chit-chat, meetings and fluffy-fluff. You pay for professional experience. And results. Do we need to meet in order to do business? No, not at all. We can do this via phone or email. Content copyright © Frederic K. Herring. 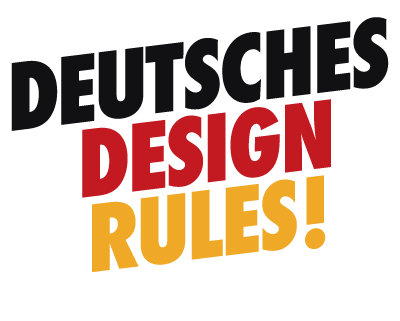 'Design Germany' and 'Deutsches Design Rules!' logodesign copyright © Frederic K. Herring. The author (Frederic K. Herring) reserves the right not to be responsible for the topicality, correctness, completeness or quality of the information provided. Liability claims regarding damage caused by the use of any information provided, including any kind of information which is incomplete or incorrect, will therefore be rejected. All offers are not-binding and without obligation. Parts of the pages or the complete publication including all offers and information might be extended, changed or partly or completely deleted by the author without separate announcement.